Stepping into a political maelstrom by accepting his appointment as Limpopo's Health Minister, the softly spoken former South African Medical Association (SAMA) chairperson, Dr Norman Mabasa, was unexpectedly robust when asked 'What on earth were you thinking?' last month. The turbulent province is now over R2 billion in debt, with a joint national ministerial task team having stepped in to take emergency corrective measures - with all the attendant internal politicking and finger-pointing. The health department, tainted by as yet unproven allegations of R314 million in disputed pharmaceutical contracts involving relatives and associates of former ANC Youth League President, Julius Malema (a close friend and political ally of Premier Cassel Mathale), is officially R437 million in the red (after narrowly honouring its Occupation Specific Dispensation (OSD) commitments). There are 39 653 vacant health posts. Mabasa told Izindaba: 'No doctor wants to claim victory on a healthy patient.' When the executive of the province approached him to 'help re-engineer' the health department, he says he reasoned that a refusal would be to avoid taking on responsibility for change. 'I thought, if we've been complaining that the system is ailing and they ask us to help ease the process, then who do we want to send to carry the responsibility? And are we going to complain tomorrow and say that people are incompetent? And of course if a person is sick they need a doctor. Also I'm addicted to serving the national interest,' he added. Mabasa landed in his new office only to be handed this year's health budget speech for delivery, and quickly brought himself up to speed, absorbing it just hours before this Izindaba interview. He rebutted any imputation of fraud or corruption in the department, saying it was under administration because it had overshot its budget by paying out the OSD to doctors and nurses. 'I doubt there was fraud and corruption. Yes, there were irregularities when the auditors came in and could find no supporting documentation for existing items but you have to draw a distinction between irregularities and corruption and fraud. Nothing has been proven yet; this can only be determined by the national administration, if needs be. I'm hesitant to comment until I get a full report from the national administrator,' he said. Admitting that he faced a 'tough task', Mabasa said he would identify and prioritise any areas of mismanagement and 'deal with the glaring poverty and need for healthcare services which we cannot ignore. People expect something different now and I have to work within systems to try and meet those expectations while balancing it with the reality out there.' He was going in with an open mind in order 'not to be corrupted by any prior information - my approach, which has worked in the past, is to accept that which is in front of me.' 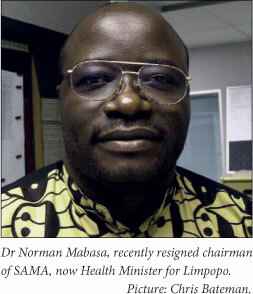 While sad at leaving SAMA where he played a pivotal role in the medical group's unity process in the late 1990s and subsequently managed, chaired and served as president of the organisation, Mabasa said doctors would not lose his contribution. 'If the profession is stable and I'm asked to serve the other side (society) and I have the national interest at heart, there's no reason to refuse. From my point of view it could be better for the profession to have someone they can relate to. They won't have to bring their CVs to meetings. They know me and I know them. I think it's a win-win,' he added. He highlighted the successes of Limpopo's health department, which he said included leading the country in immunisation and 'instituting a lot of ARVs'. 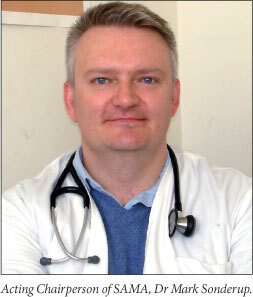 The Acting Chairperson of SAMA will be Mabasa's former deputy, Dr Mark Sonderup, a senior specialist and lecturer at the University of Cape Town/Groote Schuur Hospital in the Division of Hepatology/Liver Research Centre. Sonderup, a veteran of medical politics (former vice-chair of the Junior Doctors Association of South Africa (JUDASA), former chair of the South African Registrars Association (SARA), former chair and president of SAMA's Cape Western Branch and a member of SAMA's health policy committee since 2004, who will remain in the position until the national council elects the SAMA leadership for the next 3 years this September. Currently a mediated process is under way between SAMA and the breakaway specialists about which neither side was willing to speak for fear of jeopardising their chances of success.